In the late 1800’s/ early 1900’s, in lieu of love letters, people sometimes received Vinegar Valentines. 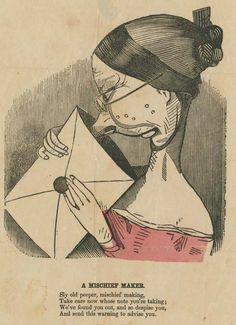 Rather than declarations of affection, these “valentines” contained short poems, accompanied by an exaggerated caricature. The notes usually targeted a person’s appearance, intelligence, behavior, or character— the Victorian-era version of trolling. She takes--and so has money to burn. Also, before the invention of the pre-paid postage stamp, people had to pay to receive their mail. As if to add insult to injury, Vinegar Valentine’s recipients had to pay for their own mocking. Yay romance!